Additional workshops and readings followed before the production’s world premiere in 2012 at The Old Globe in San Diego. 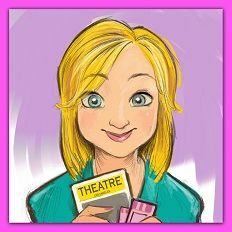 In 2015, it moved to Broadway for a 4-month run, which was filmed and screened in cinemas across the country. Not bad considering most musicals of this size and scale never make it to the finish line. But Allegiance is special. It has historical significance and the potential to educate generations of Americans about a part of our past we cannot afford to forget. You have only to look around at what is happening in our country today to see how important it is that we remember to bring our better selves to the table and not jump to conclusions when it comes to our fellow man. Following the bombing of Pearl Harbor in 1941 and FDR’s subsequent signing of Executive Order 9066, approximately 120,000 Japanese American citizens were removed from their homes and relocated to government-run internment camps. Allegiance is the story of how one family endures in a country that now views them as the enemy, even though they had nothing to do with the war. It highlights the incredible resilience of the human spirit and its never-ending ability to carry on, make due, and above all, survive. 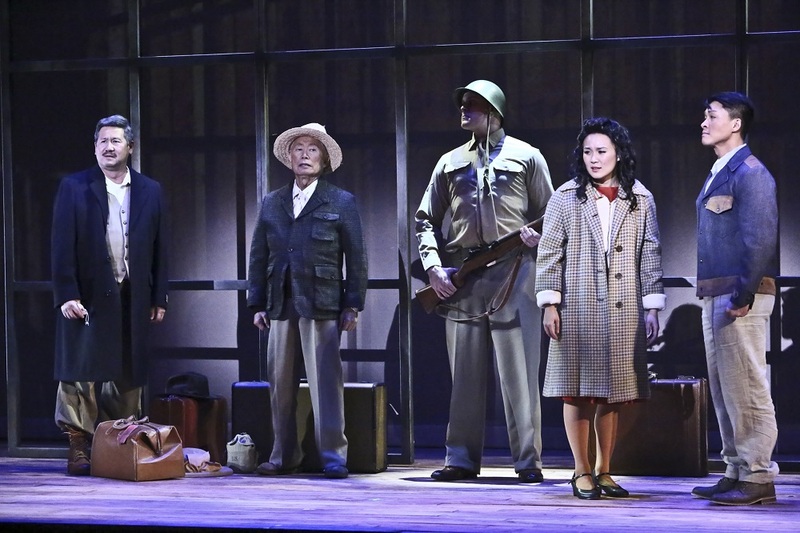 The musical is a legacy piece for George Takei who was only a child when he and his family were sent to the camps. It was his story that inspired Marc Acito, Jay Kuo and Lorenzo Thione to write Allegiance and for whom they created the central role of Sam Kimura/Ojii-chan. 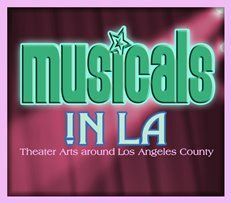 He has played it in all of the previous productions and does so again, with humor and heart, in LA accompanied by several of his Broadway castmates and a capable local cast directed by East West Player’s artistic director, Snehal Desai. 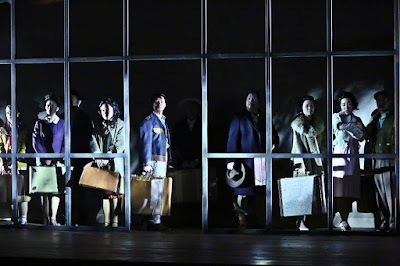 The performance style is heightened and dramatic, at times a bit overly so, but the ensemble is sincere in its desire to communicate how deeply this story resonates with them. 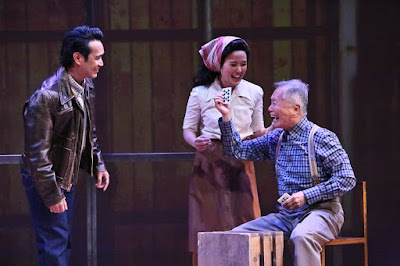 Energetic Ethan Le Phong plays the younger version of Takei’s character, an all American boy full of youthful verve and idealistic optimism. 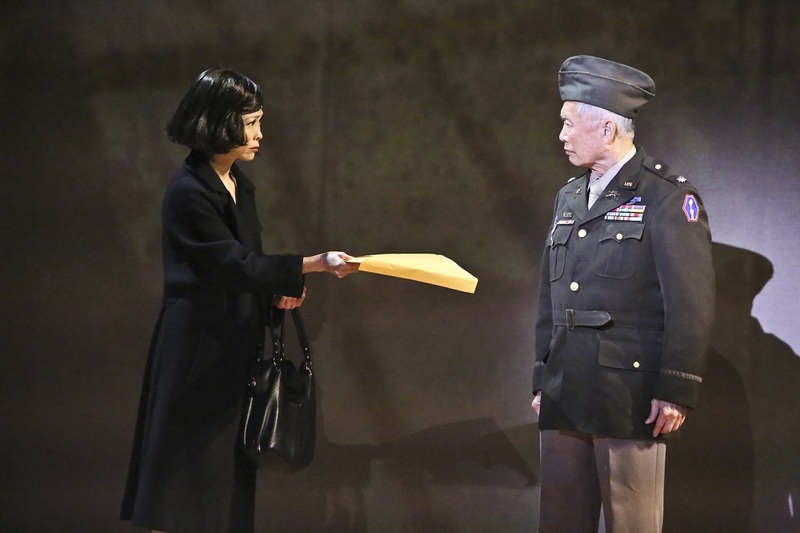 Elena Wang is his sister Kei, sounding like a Disney princess about to get her warrior wings, and Scott Watanabe is their gruff and unwavering father, Tatsuo. 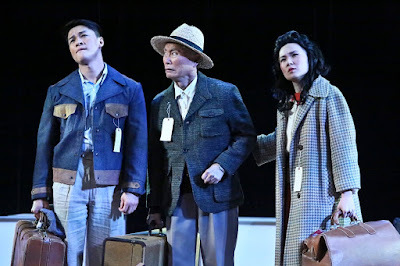 Greg Watanabe takes on the controversial role of real-life Japanese Citizens League representative Mike Masaoka who was used by the government to secure cooperation among the camps. 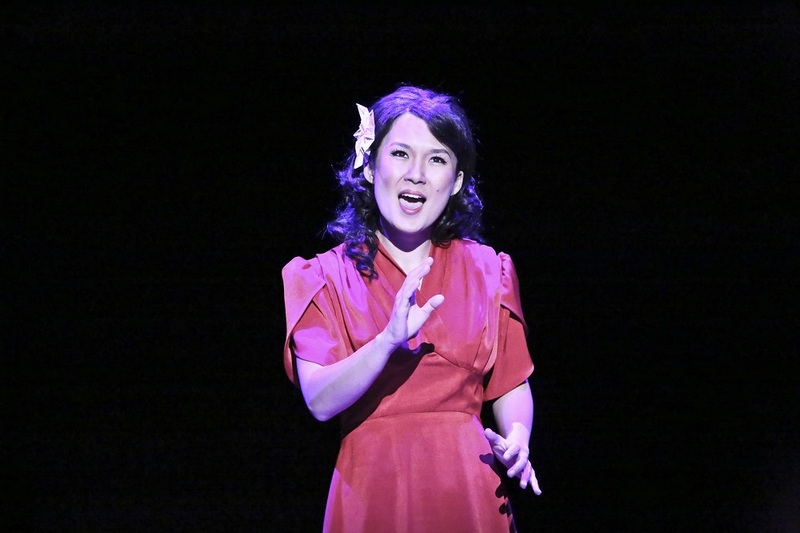 Kuo’s score is full of power ballads and galvanizing anthems that the characters deliver with stirring authority, despite the fact that some of the lyrics are set rather awkwardly to music. The occasional boogie-woogie dance number or delicate Japanese folk melody is interspersed among the more typical musical theatre-sounding songs. 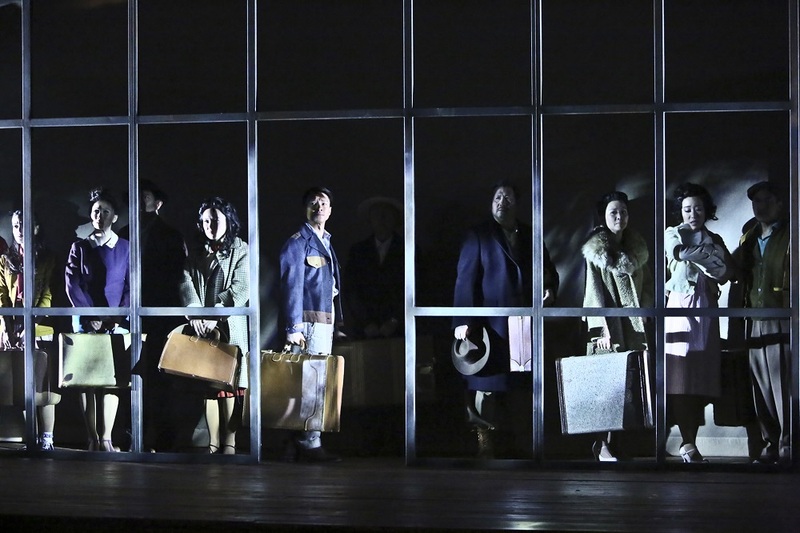 An 11-piece orchestra conducted by musical director Marc Macalintal provides thrilling accompaniment, nowhere more affecting than in the dissonances that underscore conflicting passions. The vocal sound is perennially bright, amplified by an abundance of treble in the sound system that pierces even when it doesn’t need to. 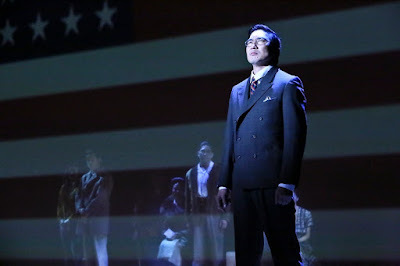 The story, which spans a 60-year time frame, plays out on a sparsely decorated set (scenic design by Se Hyun Oh, lighting by Karyn Lawrence) against a compelling backdrop of grainy black and white historical images, sepia-toned photographs, and full-color projections (by Adam Fleming). Its combined visuals create a starkly dramatic foundation for Allegiance’s underlying human story of family, loyalty, and honor.